Domestic, industrial and agriculture water use is rising across Canada, putting many rivers and lakes under increasing strain. As an organization that works to protect natural areas across P.E.I., Island Nature Trust is concerned that any increase in the number of high-capacity groundwater wells will affect fish and wildlife in the province negatively. How much water can be withdrawn while still maintaining healthy natural aquatic ecosystems? It takes the expertise of hydrologists, engineers and biologists to understand and predict the changes in fish habitat in response to altered flow regimes/water systems. Conservation practices such as longer crop rotations that include forages, better residue management and strip cropping increase the moisture holding capacity of the soil. The presence of organic matter enhances the soilʼs structure, thermal, and nutritional regimes; and decreases wind and water erosion. Healthy soils hold moisture better than those with low organic material. In other words, soils with high organic matter need less water for healthy plant growth. Withdrawing water from existing ground water supplies at times of the year when those water levels are at their lowest and at a time when 100 per cent of the surface water flow is from groundwater (springs) will further reduce the volume of ground water flowing into springs, streams, rivers and estuaries. Reduced water flow coupled with high levels of nutrients currently found in the very potato-rich watersheds to be irrigated in central P.E.I., will lead to increased over-nutrification of water systems and then to an increase in anoxic events. Wildlife in all parts of waterways will be affected by less water and by the associated issues such as eutrophication and anoxia. Extracting more groundwater from P.E.I. is about so much more than simply water volume issues. The permanent loss of high volumes of water in an already fragile aquifer at a very sensitive time of year will have negative impacts on aquatic animals and plants, including those harvested by humans. Human health is important, and the high nitrate level found in groundwater in many wells in high potato production areas is a serious concern to the health of Islanders. However, wildlife and natural areas often take a back seat to human needs and health issues. In many jurisdictions fish and wildlife management agencies sit on the sidelines of important water management decisions. On behalf of the health of our natural systems, including springs, streams, rivers, their riparian zones and estuaries we strongly encourage the P.E.I. Government to adopt a provincial water management plan to effectively integrate water quantity, quality and wildlife management and to maintain the existing moratorium on high-capacity deep water well construction. The paper printed it in the lower right page under the heading “A Reader’s View” when of course Ms. de Bie is representing the views of the organization. FREDERICTON – The New Brunswick Energy Institute plans on spending more than $500,000 on research looking at well water quality in areas where industry wants to develop shale gas. The institute, under fire for being funded by a pro-development Tory provincial government, said Monday the research would go toward establishing a proper baseline before any more wells are drilled. It will take place in four areas of southern New Brunswick where exploration or development of the controversial industry is underway: Sussex-Petitcodiac, St. Antoine-Shediac, Harcourt-Richibucto and Boisetown-Upper Blackville. Kerry MacQuarrie, a civil engineering professor at the University of New Brunswick, was selected as the project lead for the two-year study on about 500 private wells.He said it was important to find out the water quality before any further development takes place because sometimes people don’t realize there’s naturally occurring pollution with no human cause. MacQuarrie is well aware of the controversy surrounding the industry and the institute itself. Between opinion polls and the province’s two major political parties, New Brunswick society appears to be split on the merits of shale gas development, which relies on hydraulic fracturing. The long-term consequences of fracking are still not completely understood,with critics,such as the Liberal opposition, saying a moratorium should be in place until more studies can be carried out, whereas the Tory government and other shale gas supporters argue that development, with certain safeguards, should go ahead to create more jobs and wealth. Stephanie Merrill,freshwater program director with the Conservation Council of New Brunswick, works for the environmental organization that has campaigned heavily to stop shale gas development. She welcomed the idea of further study Monday, though she qualified her support by saying she would have to first see a detailed work plan and explanation of the research methods. She agreed that baseline studies were important, all the more reason, she said, for a moratorium on exploration and development. MacQuarrie acknowledged the researchers would have a bit of trouble with their baseline data if the industry continues to develop over the next two years. The team, which will consist of MacQuarrie and as many as eight research students, will send mail-outs or hold meetings to pick about 500 private well owners in the select areas. To ensure their results are not contaminated, they want to establish their baseline using wells that are at least one to two kilometres away from any existing oil or gas wells or seismic tests that have already been conducted. Natural gas is currently extracted at the McCully fields near Sussex and dozens and dozens of different hydrocarbon wells have been drilled since the 19th century,most of them now abandoned. The researchers want to look at newer private water wells built within the last 20 years when provincial regulations became stricter and data was collected on the wells. They also want sites that are nicely spaced apart with different geology so that they get a better variety and breadth of data. The study will run from April 2014 to April 2016, when a final technical report will be submitted. The project will be the first large-scale examination of natural methane gas occurrences in private water wells in the province, with the objective to collect and report baseline domestic water quality data. The focus is on groundwater quality parameters that are most relevant to the potential impact on shallow groundwater from unconventional shale gas production. Early results from the project will be provided in an interim progress report on the institute’s website. It is intended on being the beginning of a series of water studies that the institute will be funding relating to energy development. MacQuarrie described the work as labour intensive and requiring a good deal of expertise to properly obtain and analyze samples.He said they’d probably work in concert with researchers at Université de Moncton, who have already begun work on collecting data on wells that might be contaminated by radioactive materials caused by deposits such as uranium. The institute plans on spending $532,000 overall on the study. Some meaningful letters addressing the high capacity well issue — these were printed on just one day, and was “balanced” by the editorial the next day and the Potato Board ad the next….. There is enough damage caused by the use of poison pesticides and herbicides used by the large corporations to grow potatoes. It saddens me to see and hear about thousands of fish floating dead in our streams and rivers after a heavy rainfall. This has been happening year after year for too many years. If these chemicals can kill our fish, then how safe are they for the human population? We hear of illness and death caused by these chemicals in our human population, among our brothers and sisters, in the animal kingdom and among birds of prey that depend on these fish to live. Water is one of the most sacred elements of the Miʼkmaq People. The water, air and Mother Earth are all sacred elements, without anyone of these all life on Mother will die. All of these sacred elements are so interconnected that whatever we do to the water will affect the land and will affect the air. I, along with many others, am against the drilling of deep wells for irrigation of the potato crops, as I believe it will only add to the problem of more water from the potato fields flowing into our once pristine rivers and streams and seeping down into our water table. As keptin of the Miʼkmaq Grand Council for the District of Epekwitk, I strongly recommend that the moratorium on high- capacity deep wells for potato field irrigation not be lifted until we are sure these deep-water wells will not harm the quality of fresh water in this province. To date, there is no evidence that we can be sure. We have no idea what happens to our underground water, which flows under the surface. We have no idea how much of that water is available to us and what could happen to it if more deep wells were dug for the purposes of those who appear to place profit over the needs of the greater population and future generations of Islanders. The present model of industrial agriculture cannot be working for P..E.I and it is time we faced this and built the alternatives needed now and in the future. We need to realize that corporate and industrial agriculture has had its day and that trying to rescue it will inflict great damage on Mother Earth. She is already too wounded by this model of agriculture, which has resulted in destruction of land, water, trees, human and animal life. Organic farmers are not asking for deep wells. They donʼt need them because they have environmentally friendly agricultural methods, which are building up the soil, treating water responsibly and enhancing human and animal health. As Prince Edward Islanders we have to come together and demand that the government of P.E.I. maintain the moratorium on high capacity deep water wells. Set up monitoring systems on the wells that are now operating, and create legislation with teeth, so that these wells can be shut down if they are endangering our water table, our clean water supply, or causing harm to our soil. Dr. John Joe Sark LLD is keptin of the Miʼkmaq Grand Council for the District Of Epekwitk (P.E.I.). First of all I would like to say this deep-water wells venture is too risky and could destroy our Island with the protocol we are using to determine the facts needed to make such a monumental decision. The very future and existence of P.E.I. is at stake here. No water . . . nobody can live without water. The process to determine this needs to be more scientific. Without proper tests to assess the quality and quantity of the available water on P.E.I., this request should be turned over to an independent committee to ensure the proper research and studies are completed. When the data is available, an informed decision can be made. Careful consideration is required to determine potential damage to our drinking water and environment. Secondly, my research indicates health-care scientists are studying the health problems associated with eating foods that spike our blood sugars. More and more people are becoming insulin-sensitive and developing diabetes, cancer and heart problems with the spike in insulin created from eating foods like potatoes. How much longer will people consume potatoes? French fries are even worse considering they are fried in canola oil. The misinformation regarding the P.E.I. potato industry contributing $1 billion to our micro- economy is not accurate. The majority of the money ends up off-Island and does very little to grow our economy or create a tax base to pay for the health-care problems it creates. Nor does this industry compensate adequately our education requirements. Finally, I would like to leave food for thought: “Mankind will not destroy Mother Earth, man can only destroy our ability to live on Mother Earth.” Mother Earth is a living cathedral, with real feelings and needs. She must have harmony and balance, she can shake mankind off her back like a dog shaking ticks off their back. She has many ways to do this, earthquakes, floods, hurricanes, tsunamis and tidal waves. Think about it. I have lived on the Island for almost 19 years. For those 19 years, anytime the Irvings or McCains think that they are not going to get their way, they threaten to pull out and take their jobs with them. It is a bargaining tool of theirs. This is not a good debating point, it is blackmail. Showing “candid” photos of hard-working farm families is a bit like a defence lawyer pointing to a murder suspect and saying to the jury does this person look like a murderer. Again this is not a good debating point for or against deep-well drilling. We all know and respect that farmers only want to make a living and do not want to harm the environment. The trouble is past farming practices have not been good and perhaps growing potatoes for the french fry factories is not good, sustainable farming practice. When I first moved to P.E.I., my late husband and I rented out cottages for the summer. Our property backed onto a potato field. Late one fall, the field was plowed. We thought it was rather late to be plowing and then planting a cover crop. One night we had a terrible windstorm. The next day our lawns, cottages, in fact, the entire property was covered in red dust. So were the properties across the road, there was even soil in the cottages. We called the farmer, talked to him. He said he was putting in potatoes the next year, and because the growing season for this type of potato on P.E.I. was too short they had to plow in the fall. He also stated that usually the ground froze over and there was snow cover so it did not matter. At the time I thought why are they growing a type of potato that requires a longer growing season than they naturally have. Of course these potatoes were for french fries. It seemed to me t was neither scientific or good farming practice that one should hope the ground froze before the winds came. It was a terrible mess to clean up in the spring and I wondered whether the farmer was hoping the wind would blow the soil back onto his field. In Australia, which is a continent not an island, they have been irrigating for years, especially for the wine industry. Now their rivers are drying up. So please no pictures or threats, a proper debate is needed. There are three things Canadians seemingly take great pride in — hockey, our Medicare and our vast supply of fresh water. With that being said it appears the only thing thatʼs thriving is our hockey after another gold performance at the Olympics. Prince Edward Island has seen a disintegration of our health care and our fresh water supply. With wait times increasing and residents having to incur expensive trips or even hitchhike to Halifax for health services itʼs hard to believe we live in Canada. Our health-care system is falling fast as well. The download of health- care costs from the feds to the provinces makes it hard for any health care to function. Itʼs made even worse by a provincial government that doesnʼt seem to understand spending wisely versus spending foolishly. When thinking of fresh water, many will remember another summer of water problems for the city of Charlottetown as well as continuous river closures due to runoff in the summer and fall over the last few years. Itʼs hard to believe P.E.I. with all its fresh water faces these problems. Recent calls for deep-water wells set a dangerous precedent as it opens up the already fragile Island water table to more pressure. Itʼs time we as Islanders take a stand against this and work to protect and preserve our Island water for future generations. Problems in Charlottetown over the last two summers with the Winter River Watershed should serve as a wake-up call and remind us that without proper care and protection of our water resources — we will run out. There was a time when I was growing up that buying bottled water was unheard of but nowadays this has become the norm. I love P.E.I. with all my heart but itʼs becoming hard to live here. Itʼs time for accountability and transparency, wise spending not wasteful spending and care for the citizens of the province. Perhaps then even our politicians will be worthy of a gold. And the last recommendation in the section of The Carver Commission report dealing specifically with Aggregate Land Holdings discusses “Land Grabbing”. The term ‘land grabbing’ refers to the contentious issue of large-scale land acquisitions, primarily the buying or leasing of large pieces of land in developing countries, by domestic and transnational companies, governments, and individuals. While used broadly throughout history, land grabbing as used today primarily refers to large-scale land acquisitions following the 2007-2008 world food price crisis. On Prince Edward Island, the chief concern has been the purchase and control of land by non-residents, primarily shore frontage. The Commission’s research into the question and consultation with Islanders indicates that non- resident ownership is not as great a concern as it was when the Lands Protection Act came into force. The real estate industry provided valuable insight on this subject. Their experience shows that following the 2008 global financial crisis, demand for property here slowed considerably. Since then, the trend has been toward sales by non-residents rather than purchases. However, in the Commission’s view, this temporary trend does not mean Prince Edward Island will remain immune to market pressures in the longer term. As presently written, the Lands Protection Act offers no protection against purchase by any resident of a large land holding of just less than 1,000 acres. Such purchases by resident individuals can be achieved without IRAC and Executive Council approval. Since the definition of ‘resident’ is a person who resides in the province for 183 days per year, non-consecutively, it is conceivable that offshore interests could acquire large tracts of land through the use of creative planning. For example, students attending university or college here for a couple of years could each buy up to 1,000 acres of land. Or someone could assist them with the purchase. In addition, the Act offers no protection against the purchase of farmland by individuals who have no intention of keeping it in agricultural production. 2. That agricultural land should remain in food production, preferably under the control of resident bona fide farmers. As it now stands, a non-resident can acquire up to 5 acres of land or 165 feet of shore frontage without Executive Council approval. Those who want more must apply to Executive Council, and approval is usually granted. The Commission believes the provincial government must seek the views of Islanders on the question of whether non- residents should be permitted to acquire large tracts of land. The related question of whether residents who are not bona fide farmers and who have no intention of farming should be able to hold 1,000 acres needs to be debated as well. In other words, how much is enough, and how much is too much? 5. That the provincial government use data collected under the Registry Act to monitor the sale and purchase of large tracts of farmland by residents and non- residents who are not bona fide farmers, and place restrictions on future transactions, if deemed necessary; exceptions would be made in cases where non-residents receive land from residents via will or inheritance. These are important questions that must be addressed, but further public discussion and debate are required. Land grabbing is a global phenomenon. It became an issue on Prince Edward Island in the 1960s when non-residents began buying shore frontage, and it remains a concern to this day. While the global economic downturn has slowed interest from non- residents, the Commission sees this as only a temporary reprieve. The time will come again, perhaps soon, when Island land will again come under pressure from non-resident buyers. Government should have a policy in place to deal with the demand, and devise means to protect our precious shorefront and our most important natural resource the land from those whose interests may not be what’s best for Prince Edward Island’s land. http://www.gov.pe.ca/lpa/ The link to the report is around the middle of the page. Buy two big ads, get one editorial free. This is the same package which the Department of Transportation got regarding Plan B! The stakes are being raised in the divisive debate on deep-water wells for supplemental irrigation of potatoes on P.E.I. Now, itʼs about processing contracts, the ability of growers to fulfil those contracts and the future of our two major french fry processors. Last week, the spectre of Cavendish Farms or McCains Foods reducing their contracts or even remaining in the province was raised publicly during a meeting of a legislative standing committee. There have already been warnings from processors that the demand for P.E.I. french fries is decreasing because of additional competition and supply from other market areas. There are suggestions that contracts will be reduced while processors are starting negotiations with a lower price offer over last year. This doesnʼt bode well for contractors who grow over 60 per cent of the Islandʼs potato acreage. Outside of the agricultural sector, there is almost universal opposition to lifting a 10-year moratorium on deep-water wells. Even inside the farming community, the NFU is opposed to any changes. Other farmers, including some potato growers, are either opposed or neutral on the issue. Like Daniel thrown into the lionʼs den, three farmer representatives from the Innovative Farm Group (IFG) appeared before the standing committee. IFG represents eight family farm operations in central P.E.I. who grow 4,000 acres of potatoes on a rotational production of 12,000 acres. Some of the farms already have deep-water wells, others use ponds fed by wells and the rest use a pond and surface water mix. If irrigation is needed, deep-water wells are the most efficient option, IFG representatives told the committee. Without the ability to guarantee quality, farmers risk losing processing and table markets where even one dry week can have a significant impact on yield. If Island growers cannot supply a certain quality and size of potato, processors have options with growers and plants in other provinces or states where opposition to deep-water wells is limited. The standing committee and government have difficult tasks ahead as they must decide if compromise is possible to protect our water resource even if science supports additional deep-water wells and thus offers farmers a chance to remain competitive in an increasingly competitive marketplace. The “Daniel in the lion’s den” comment is peculiar. First, the editorial doesn’t credit that one of the presenters from IFG when starting his presentation used the reference to a lions’ den. Second, the spectators were a bit taken aback by the allusion, as the atmosphere had been one of respect (and perhaps concern for the situation these farmers are in), and Chair Paula Biggar immediately and forcefully said no one would be treated disrespectfully in her committee room as she welcomed them. and be rescheduled for Friday, starting at 10AM. National Farmers Union District Convention which is being held this Friday, March 14 at the Dutch Inn. Registration is at 9:30 a.m. with the meeting getting underway at 10:00 a.m. Our guest speaker is our National President, Jan Slomp who will be speaking on building alternatives for a better farming and food system. As well, we will have a panel discussion on high capacity wells and fracking. Reports and resolutions will be considered during the day with adjournment about 4:00 p.m. Everyone is welcome to attend. Registration fee is $20 per person which includes a hot and cold buffet at noon. This one raises an issue about radon, but has anyone actually heard about his concern? Perhaps we all need to start asking about it. P.E.I. groundwater contains radon as a dissolved gas. Have the deep-water wells in Prince and Queens counties received a radiological assessment? For I believe there are meteorological and health consequences to their operation. Specifically, what are the activities of radon, 86Rn222, in these wells? How does it compare with shallow water wells? What is the airborne maximum permissible concentration (MPC) of radon on P.E.I.? If you irrigate with P.E.I. groundwater by spraying, in the flight of the water droplets through the air, radon will evaporate out of the water droplet, effectively what is called an air stripper; now a radon stripper. Some radon evaporates (stripped out), some doesnʼt. The radon stripper effect will form a radioactive radon gas cloud, a radon plumb. The radioactive half-life of 86Rn222 is 3.8 days, and a significant concentration of radon may occur near the spraying source in light winds as well as down wind. When radon decays it emits an alpha particle of 5.5 million electron volts, very energetic. get ~183,000 ion pairs from one alpha particle. There is a background level of ionization in the atmosphere caused by cosmic rays and background radiation. Airborne irrigation will add to this considerably; so much so that the resistance of the earth atmosphere is decreased, the electrical field of the earth arcs over, and you have thunder and lightning. Health Canada should also look into the health consequences of the deep water wells. As a public health matter, it will also prove useful to know the MPC of radon for groundwater, as municipal wells are also involved, at least indirectly. The 1,000 and 3,000 acre limits were by far the dominant issue in public meetings held by the Commission. Calls for increasing the limits came mainly from the potato industry, through the Federation of Agriculture and the Potato Board. Not all farmers and not all agricultural organizations called for increasing the limits however. The National Farmers Union opposes any change to the Lands Protection Act and Regulations. Among non-farm groups and individuals, the vast majority favoured the status quo. 2. The door should be left open for someday lowering the aggregate land holding limits. Bearing all this in mind, the question must therefore be asked: If none of the provincial and industry strategies mentioned above calls for increasing farm size as a way to improve farm profitability, enhance rural development, strengthen tourism, or promote environmental sustainability, on what basis can increasing the aggregate land holding limits be justified? 1. What is the relationship between potato acreage and profitability for a potato farm? 2. What is the evidence that the present aggregate land holding limits are having a negative impact on the profitability of individual potato farms? 3. If further consolidation occurs in the potato sector, what impact will this have on employment and contribution to provincial Gross Domestic Product? 4. If further consolidation occurs in the potato sector, what impact will this have on rural communities? 5. How does the Agricultural Crop Rotation Act fit into the picture? To what extent is it being enforced? In other words, how many potato producers are in full compliance? 6. Given current aggregate land holding limits under the Lands Protection Act, has the Agricultural Crop Rotation Act become a deterrent to future growth of the potato sector? 7. Should the Agricultural Crop Rotation Act be changed, or can ways be found to use it, in combination with the Lands Protection Act and government programs, to encourage better land management practices? 8. What is the impact of the ‘double- counting’ provision that requires landowners to include both land leased in and land leased out as part of their aggregate land holdings? What would be the benefit, if any, of removing the requirement to count land leased out? 9. What are the problems with the Environmental Exemption Regulations introduced in 2009 as they are currently written and enforced? Can they be changed to better reflect the needs of the agriculture industry, or should they be abolished? So onto the what he actually recommended next. A Standing Committee meeting tomorrow, starting at 1PM, at the Coles Building next to Province House, with presentations (I think) from the National Farmers’ Union, The PEI Watershed Alliance, Central Queen’s Wildlife Federation/West River, The Innovative Farms Group, and the Green Party PEI. If you can drop by for a little bit, that will support (most of) these groups and show the politicians that people are interested in this issue. I would like to congratulate the P.E.I. Potato Board on their information ad, Thursday, Feb 27. I did not realize that by allowing deep-well drilling it would be a solution to the nitrate problem on P.E.I. Too bad they did not come forward sooner with this approach. Their perspective that this is a lot of storm about a very small issue, that it will not take much water, and letʼs just trust them and the government to do the right thing is a little hard to take. As many letters to the editor have pointed out both the industryʼs and governmentʼs track records on this have not been good. We have been though all this before with Plan B and I see the same outcome. In fact I will wager money that the government will approve this plan. Then we can wait for the ads about how great fracking will be for the island. While the purpose of the Act is clear and easy to understand, the legislative framework, consisting of the Act and the Regulations, is very complex and difficult to understand, even for those who deal with it on a regular basis. Few individuals and corporations make application, or even complete mandatory reports, without help from accountants and lawyers. Most letters to the editor published in The Guardian get posted on their website, but occasionally one or two don’t make it. Often an e-mail from a reader will point it out to them. Sometimes it takes a few reminders. It appears as if the potential lifting of the moratorium on high capacity wells for irrigation of potato fields may be — excuse the pun — a watershed issue on P.E.I. The crux of Minister Sherry and the potato boardʼs shared position is that “the science” supports a lifting of the ban. But science is not a package of carefully filtered information presented as a final, incontestable truth; it is a dynamic, continuously unfolding process. Science is the ongoing clash of differing ideas from which the light of truth temporarily shines, until newer and better information illuminates the issue further. When it comes to ground water on P.E.I., we know so very little. As the saying goes, itʼs not that we donʼt know all the answers, we donʼt even know the right questions to ask. The complexity of Island hydrology, and the importance of water in our lives insists that we proceed with extreme caution. Many informed experts have already expressed grave concern about lifting the moratorium, and most “ordinary” Islanders with generations of accumulated knowledge seem to be saying that the lifting of this ban represents a line in our red soil that we must not cross. Unlike some other issues, when it comes to our water, there is no Plan B. We must get this right first time. Islanders have an important decision to make; we need farming — indeed I believe that our provinceʼs economic future will depend perhaps more than ever before on farming. But it must be a type of farming that will rebuild our soil, not denude it, will protect our water, not threaten it. I am not anti-farming — quite the opposite — but I am anti-screwing up our water. Leader, Green Party of P.E.I. Since 1995, leased land is deemed to be in the possession of both the lessor and the lessee, and it is counted towards the aggregate land holdings of both. This is the so-called ‘double-counting’ or ‘lease-in-lease-out’ provision. Executive Council retained its authority for decision-making and delegated investigation and enforcement of the Act to IRAC. In December 2009, the Commission on Land and Local Governance (“Judge Thompson’s Report”) released its final report. It made a similar recommendation to the 1998 Standing Committee on Agriculture, Forestry and Environment: that individuals and corporations be permitted to own or lease 1,000 and 3,000 acres, respectively, ofarable land, meaning land in agricultural production. Government responded by amending the Lands Protection Act Exemption Regulations. These Regulations allow an individual to exempt up to 400 acres and a corporation to exempt up to 1,200 acres of land that is certified by a government agency to fall within an environmentally significant land holding classification, as defined in the Environmental Exemption Regulations. It is the same approach as that applied to the Island Nature Trust under the Natural Areas Protection Act. I am not a scientist, nor am I a farmer, but I am interested in what happens on Prince Edward Island. And I am puzzled. Wednesday night I sat in a room with a few hundred other people concerned, as I am, with what is happening to this Island. I listened to John Joe Sark speak of how sacred the four elements are to the Miʼkmaq; I heard Reg Phelan discuss farming practices; Maude Barlow talked about the global water situation and Daryl Guignon explained how simple it would be to change and, in fact, reverse what is happening to our valuable resource — water. Each of these people was able to explain in clear simple terms what needs to happen to improve our farming practices, halt anoxic events, prevent erosion and reduce the need for deep water wells. How is it that I understood and yet our politicians canʼt? Apparently there are stacks of studies that have been completed by qualified people explaining all this and more. Studies that are sitting on shelves being ignored. It is about time that our government listened to its people as opposed to the large corporations. When the streams dry up, the fishing industry dies, the soil is depleted and P.E.I. is a desert, the potato giants will have moved on to “greener pastures” and we, the people, will be left to sweep up the sand. The P.E.I. government regulates pesticides. Environment Minister Janice Sherry is paid to preserve and enhance the quality of our natural environment, including water, air, soil, flora and fauna. Her department is supposed to enforce environmental laws. A federal study confirms that after years of dumping oilsands tailings into holding ponds in Alberta, there are tailings leaching into groundwater and seeping into the Athabasca River, a source of drinking water. They estimate each pondʼs seepage at 6.5 million litres a day. What about our Waste Watch containment area in West Prince? Are heavy metals being leached into ground water? The potato industry has a problem with wireworm. Some producers want to fumigate (sterilize) the soil with Vapam (metam sodium), which is a carcinogenic or cancer-causing compound. The strawberry industry also has a disease virus transported by an aphid. A contract between our P.E.I. government and Environment Canada has supposedly been signed and Westeck will fumigate strawberry runner fields in West Prince this summer. Wayne MacKinnon, a government spokesman, claims this is only a pilot research program for experimental purpose to see how much leaches into the groundwater. Nitrates leached into our drinking water. Then what? West Prince is about to become guinea pigs for the federal Conservative and P.E.I. Liberal governments. Chloropicrin, a carcinogenic, will be applied. This pesticide is highly toxic, may be fatal if inhaled, can harm the heart, kidneys, liver, lungs and eyes. If ingested it can cause colic and death. It is toxic to fish. Fumigants are inherently dangerous pesticides. Each year groups of us travel to West Prince strawberry fields and spend hundreds of dollars harvesting their fruits. Personally I will not be picking and purchasing strawberries from West Prince anymore. Minister Sherry, are you going to do your job and stop this project, or sit on your hands as usual and watch the demise of a West Prince industry? What is the stance of all elected federal MPs on this atrocity? He sketches the history of land ownership since European settlement, of the absentee landowners and the money from Confederation in part being used to buy back part of Island land from the absentee landowners in England, and of various forms of some sort of LPA, always trying to figure out who wanted land and for what, and keeping some control in the matter, whether the rules were enforced or not. At several public meetings, the Commissioner expressed the hope that farmers and the farm organizations that represent them could agree on many of the issues that led to the current review of the Lands Protection Act. common points of agreement between the National Farmers Union and the Federation of Agriculture, and they have been endorsed by both organizations. It is simply not possible to achieve consensus on all issues that fall within the Commission’s mandate. The positions of the two general farm organizations are diametrically opposed on the issue of aggregate land holding limits. However, there is broad agreement in the agriculture community on the shared values outlined below. 10. Farmers need to educate non-farmers on why farming is essential to our everyday lives and to life itself. (Now, that last one can get stuck a bit in one’s craw, as we see it is all to easy to manipulate the word and its purpose.) But a lovely and constant set of values. Before we discuss deep-water wells, we need to face our record on the Crop Rotation Act. Thatʼs the 2002 law which mandates a three-year crop rotation in potatoes. This is our history, itʼs where promises meet performance and the record is not good. About a quarter of potato operations are in violation of the act. This is a big reason people donʼt trust government to regulate the industry. It didnʼt have to be this way. If that was the situation, people would still be cautious, they would still want to proceed slowly, if at all, but they would also appreciate farmersʼ efforts to take care of the soil and they would be more inclined to believe governmentʼs assurances. As it is, the two camps on this question have very little basis for trust. Comprehensive science is only part of the solution. There was a time when science told us there were plenty of cod in the sea and plenty of big trees on the land. The scientists were right, but we mismanaged those stocks and now theyʼre gone. Regardless of how much water is under our feet, it will be possible to ruin that resource too. Whatever policy we arrive at regarding deep-water wells will have impressive language around regulation, but those words will be empty if we canʼt trust the regulator to enforce them. I have been meaning to dig up and go through Horace Carver’s Report of the Commission on the Lands Protection Act, especially since at the end of March, Mr. Carver is speaking to the March 27th Thursday meeting of the very same Standing Committee of Agriculture, Environment, Energy and Forestry; and I think there may be legislation in the spring sitting of the Legislature, which begins in April. There are 29 recommendations, so with some background and perhaps a day off for reader-fatigue, let’s march ahead. who was a Conservative MLA from 1978 to 1986, during which time Alex Campbell, Bennett Campbell, Angus MacLean, and James Lea were Premier. He represented PEI in the Constitutional talks in 1981. He fought for the right for PEI not to be guided under property rights guaranteed at the federal level and have the right to a provincial Lands Protection Act, and worked drafting the first LPA in the 1980s. Carver was appointed in November 2012, when Plan B was just getting cleared and bulldozed, and in early 2013 started consultations. He set the bar high as far as reaching out, appearing in the media often and having several public events, and then basically doing a whistle-stop tour of the Island (if we wistfully still had trains), making sure to reschedule meetings due to bad weather, and have lots of info on the website. The sessions, as you may remember, were long and he pretty much let people talk. Then he scooped up all his papers in May and his small staff and wrote his report, submitting it a day before the deadline in late June. It languished a bit (out of his hands) and was finally released in late Fall. OK, more tomorrow on it. What an interesting 24 hours it has been! The presentation from the Coalition for the Protection of P.E.I. 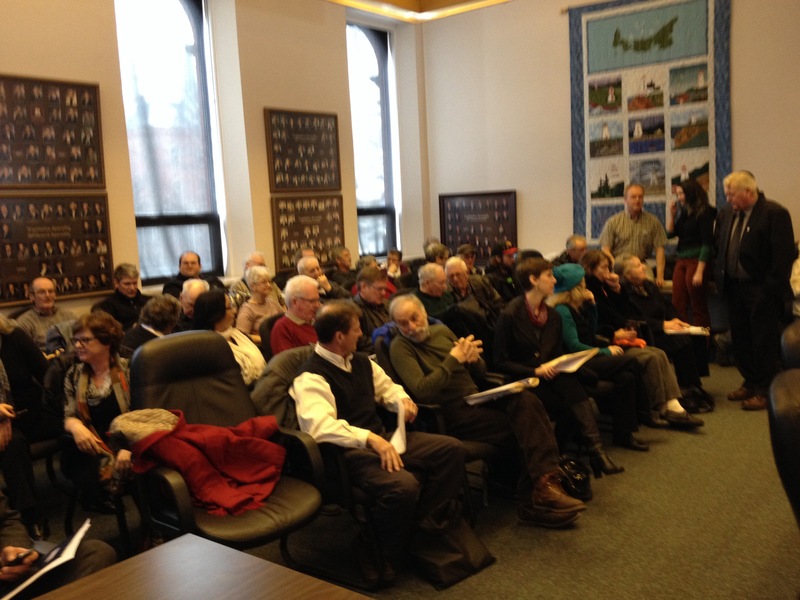 Water was well (ha) received at the Standing Committee yesterday, and it was great to see so many concerned Islanders in the guest section. Attached is the submission to the Committee. The Standing Committee decided to extend its meeting hours to 1-5PM for Thursdays March 6th, 13th and 27th, to fit in the number of concerned groups. If people are able and interested, they could consider attending other presentations. Next Thursday the four groups presenting are the National Farmers Union, the Watershed Alliance, the Central Queens Wildlife Federation/West River Watershed Association, and Innovative Farms Groups, the last of which presented for lifting the moratorium at the Watershed Alliance workshop in November. A coalition made up of 16 groups and over 200 individuals from across P.E.I. urged MLAs Thursday to keep the current moratorium on deep-well irrigation in place. The newly formed Coalition for the Protection of P.E.I. Water made an impassioned presentation Thursday to a provincial standing committee currently holding hearings on the issue of deep-water wells. lifing the moratorium on deep-well irrigation to these wells to be drilled. “It is imperative that respect for protecting fresh water be at the forefront of these discussions,” OʼBrien said. Over 50 supporters and members of the coalition packed into the normally empty public gallery of the committee chamber to show their support. The issue has sparked a heated public debate over water use in Prince Edward Island, and whether the province has enough groundwater to support industrial irrigation of potato crops. The P.E.I. Potato Board and Cavendish Farms argue some Island farmers need access to more water in order to keep pace with competitors in the mid-western United States. They also point to data compiled by the provincial Department of Environment showing P.E.I. has a high annual recharge rate and that increasing the use of groundwater for irrigation of crops would use only a fraction of available groundwater resources. But the Coalition for the Protection of P.E.I. Water says this data is incomplete and should be peer-reviewed by scientists, experts and the public to ensure all relevant information has been included. This was one of five recommendations presented to the standing committee Thursday. The coalition also wants a comprehensive water policy developed for Prince Edward Island, suggesting perhaps a commission could be struck for this purpose. It further wants government to determine and publish the full environmental, agricultural and environmental costs of lifting the deep-well ban. “This is a time when we should be exercising particular care about the use and protection of our water,” OʼBrien said. Miʼkmaq Keptin John Joe Sark also shared his concerns over the effects the wells could have on P.E.I.ʼs water resources. He said he would be the first to launch a court action should P.E.I.ʼs water be contaminated as a result of the wells. “I strongly recommend that the moratorium on high-capacity, deep wells for potato field irrigation not be lifted until we are damn sure that these deep-water wells will not harm the quality of fresh water in this province,” Sark said. The committee has a busy schedule of meetings planned on the issue as more and more individuals and groups continue to request the chance to lend their voice to the growing debate. Next week, the National Farmers Union, the PEI Watershed Alliance, the Central Queens Branch of the P.E.I. Wildlife Federation and Innovative Farms Group will have their chance at the committee table. For almost six years, I volunteered on the P.E.I. Environmental Advisory Council (EAC). I always appreciated the many presentations made to the EAC by staff and experts from the Environment Department and other federal and provincial public servants. My final two years on the EAC were as chair. My objectives were to be fair, objective and engage the EAC council to participate objectively in debate on the many issues that concerned the environment on P.E.I. Finally, we respectfully advised the P.E.I. ministers of environment in accordance of the terms of reference for the EAC. When I began volunteering the EAC had just released the report “Upstream Downstream” and unfortunately many of the reportʼs recommendations still have not been dealt with. I believe our greatest work was our foundation document on a Conservation Strategy for P.E.I. Retired judge Ralph Thompsonʼs report, Commission on Land and Local Governance, gave the EAC the direction in his second recommendation to create a Conservation Strategy for P.E.I. Our objective was to develop a discussion paper towards such a strategy. This document was finished just as the Plan B protests began and public meetings on a P.E.I. conservation strategy were stalled. We had begun a broad, open conservation strategy to protect P.E.I.ʼs natural capital, including our groundwater. 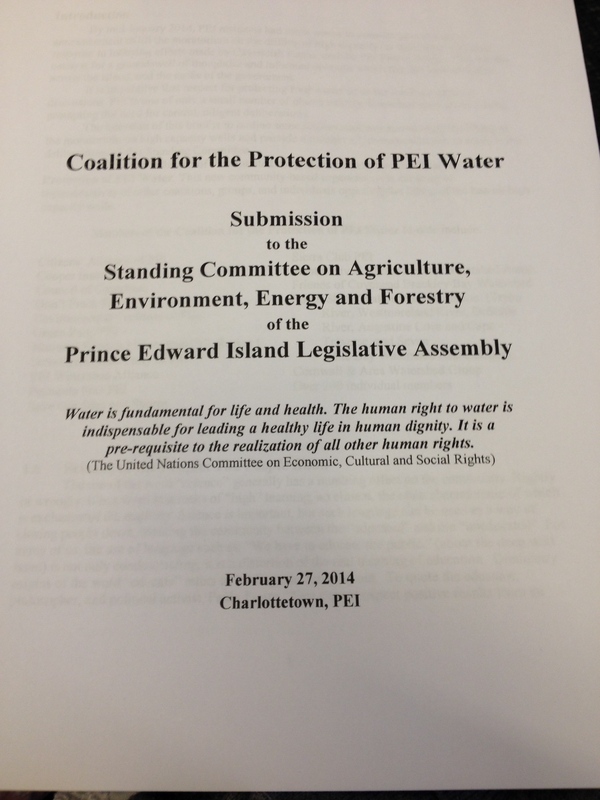 This must include all the stakeholders which rely on P.E.I.ʼs ground water. Every Islander, scientists, industry representatives and all levels of government need to be at the table. An adequate supply of quality water is our life. The issue of fracking, deep wells and the seriousness of protecting our ground water need to be addressed. Recent public comments on deep wells have caused me, and many others, great concern. I am sorry but that is not acceptable for any environment minister to say. If she or any government were concerned then they would make public the data they have on all public wells to show the conservation and quality of the water. Bring the scientists, agronomists and the data forward, let their peers and all Islanders judge what quality of water we want to drink. I have not spoken to any farmer yet who wants to pay for an expensive irrigation system they donʼt need, donʼt want and certainly none want to damage our ground water. I havenʼt heard that producers will get any extra dollars for a hundred weight of potatoes produced with an irrigation system. I also donʼt expect Island taxpayers will want to pay for a subsidy scheme to pay for this equipment to sit in a field for all but one in 10 years. During my six years on the EAC, we had the opportunity to bring in scientists and experts to explain many issues about the P.E.I. environment, including ground water. One particularly graphical presentation was made by a provincial hydrologist, Mr. Yefang. His research showed the levels of nitrates found in test wells deeper into P.E.I. wells over a 20-year period. This data was taken from an area of high irrigation and agricultural production. Surely this data was made available throughout the government. What else are they not telling us? Why wonʼt they release this presentation and other data? The public needs to see all of the science. I encourage all scientists and agronomists to step up to the plate and make your data known. Protecting our environment is about our health, life and prosperity where we live today. Alan Hicken of South Pinette is the former chairman of the P.E.I. Environmental Advisory Council. More about related to calculating “recharge of aquifiers”, using swimming pools as a visible analogy. Like most regular readers, I have been following with interest, the numerous articles and letters in The Guardian on the issue of deep-water wells. In the headline article of Fridayʼs (February 14) paper, “ No decision made on deep-water wells: Sherry,” there was an assertion attributed to Mr. Bruce Raymond (manager of watershed and subdivision planning for the province), that is worthy of pause and re-examination. Mr. Raymond is quoted, saying, that the rate at which P.E.Iʼs groundwater is replenished every year is “equal to 154 Olympic-sized swimming pools for every square inch of the Island”. According to Wikipedia, an Olympic-sized swimming pool contains 2.5 million litres of water, with a volume of 88,0000 cubic feet. It is easy to determine that one cubic foot of water would be 144 feet in height on a single square inch of P.E.I. soil. It follows that 88,000 cubic feet would be 2,400 miles high! That is for a single Olympic-sized swimming pool. For 154 pools, this tower of water would reach an amazing 369,600 miles in height, which is 1.5 times further away than the moon. Hmm. That would be one wicked replenishment rate. According to Island information, however, “the average yearly rainfall is 1125.8 mm and the average yearly snowfall is 318.2 mm” on Prince Edward Island. That translates to approximately 1.5 meters (or 5 feet) of precipitation per year. Comparing 369,600 miles to 5 feet, we can determine that the Olympic-sized pool reference is out by a factor in excess of 390 million. Clearly, either Mr. Raymond was misunderstood or he misinterpreted the data. Either way, it seems clear — it would be better to simply disregard any future reference to swimming pools.